ABC’s unapologetic hour-long series, American Crime, tackles race, class, gender, politics, criminal justice, family and faith. Set in Modesto, CA, the complex drama chronicles the investigation and emotional trauma following the shooting death of a young white married couple, which connects individuals spanning various ethnic origins. American Crime stems from a lunch meeting between show executive producers John Ridley and Michael J. McDonald in 2013. They discussed hot topics like Trayvon Martin, Jodi Arias and their affinity for the documentary The Central Park Five. Resigning as ABC’s Senior Vice President of Drama Development to head his production company, Stearns Castle, McDonald had been a fan of Ridley’s commentaries on race. He read Ridley’s Oscar-winning manuscript for 12 Years a Slave, recognizing without reservation that the writer’s insights could capture a realistic portrayal of American society. Ridley, who was a writer for Martin, Third Watch and Fresh Prince of Bel-Air, was seeking to get back into creating television. 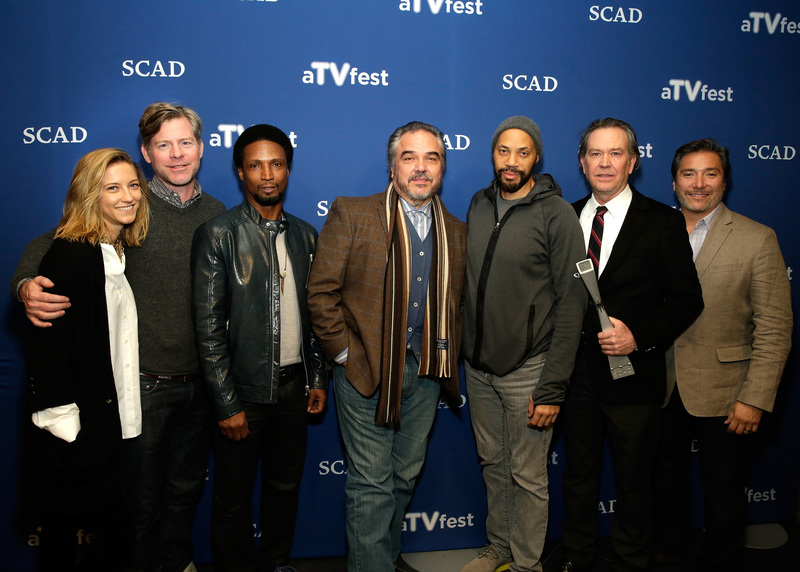 Prior to screening American Crime’s first two episodes at SCAD Atlanta’s #aTVfest, Ridley spoke about how the show challenged him to interrogate and explore provocative subject matter. In mid-production, both Michael Brown’s murder in Ferguson, MO and Eric Garner being choked by police officers in New York occurred. Ridley is aware that audiences and critics may draw parallels from the storylines. He hopes that people will critique America’s state of affairs. American Crime was taped in Austin, TX over four-and-a-half-months. The dedicated showrunner worked diligently on-set to foster a highly cooperative tone amongst everyone. He recruited an eclectic group of writers, went after performers who could deliver emotion and even hired numerous female directors. The cast immediately took notice of Ridley’s leadership and ambition. Caitlin Gerard, who plays the drug-addicted Aubrey Taylor, was impressed with the NYU alumnus’ welcoming attitude. The actress addresses how the writer responsible for films like Undercover Brother, Red Tails, Three Kings and All Is By My Side consistently gave his undivided attention to each individual regardless of role. McDonald, an executive at UPN prior to his ABC tenure, didn’t have a lot of direct contact with Ridley during the development of Ridley’s hip hop-themed series, Platinum. Partnering with Ridley on American Crime allowed McDonald to have a better understanding of television’s creative process. Seated at a roundtable, co-stars Elvis Nolasco, Benito Martinez and W. Earl Brown each elaborated on Ridley’s humility. Martinez, who plays hard working, overprotective single father, Alonzo Gutierrez, met Ridley at rehearsal, also the day after Ridley won his Academy Award. Nolasco, who plays Aubrey’s codependent drug-addicted love interest, Carter Nix, previously worked with Ridley on Da Brick, a pilot for HBO. The actor was familiar with Ridley’s vision and nurturing approach to filmmaking. American Crime is taking How to Get Away With Murder’s time slot. The cast and crew are confident that the series will spark dialogue around dinner tables and social media. Ridley just hopes viewers will appreciate the show’s top quality production aesthetics and his team’s work ethic. The series premiere of American Crime debuts on Thurs., Mar. 5 on ABC at 10:00 p.m. ET. The post was created by Christopher A. Daniel, pop cultural critic and music editor. He is also contributing writer for Urban Lux Magazine and Blues & Soul Magazine. Follow Christopher @Journalistorian on Twitter. Like The Burton Wire on Facebook. Follow @TheBurtonWire on Twitter.